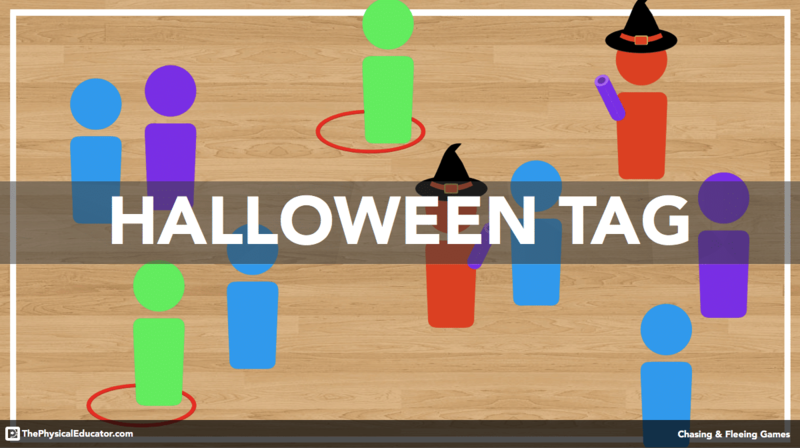 Halloween Tag is a Standards-based Chasing and Fleeing game that is suitable for Elementary level PE programs. It’s a great game to play on the 31st and have fun with your students! It can be played in your gym or outdoors. Students start off in a scattered formation. One student will be the witch and is given a long pool noodle (their broom) and a short pool noodle (their wand). Another student will be the wizard and is given a short pool noodle (their wand) that is a different colour than the witch’s wand. On the teacher’s signal, students begin to run around the playing area, attempting to avoid being tagged by the witch (who uses the wand to softly tag others). If a student is tagged, they lose all of their bones and turn into a blob (they plop on the floor). The wizard turns blobs back into runners by tapping them three times with the wizard’s wand. The witch may not tag the wizard. After a pre-determined amount of time, the teacher selects a new witch and wizard. Players get into a scattered formation. On the teacher’s signal, all players begin moving about the playing are while avoiding contact with other players and to look out for different coloured lines. This build exists to help students understand the limits of the game. Players now play the game with the full version of the rules. The teacher may play several rounds at this build, adding additional witches with every new round. Two players are given pinnies and will play as the ghosts. If a player is tagged by a ghost, the tagged player must step out of bounds, dance for ten seconds, and then return to play. The ghosts cannot be tagged by the witch. One player is selected to be the zombie. The zombie must move around the playing area while dragging a hoop with one of their feet. If the zombie tags another player (they cannot tag ghosts, witches, or wizards), the tagged player gets a hoop and rejoins the game as a zombie. Therefore, there will be more and more zombies in the game.